As she walked toward me I felt compelled to grab a few impressions immediately….I no longer bother to ask myself why I do this. I do it because there are certain groups of people that I’m fascinated by, and it’s usually an interest based in my own feelings about my life, especially as a child, and my residual anger over the way things were for me. I’m no crusader, but when I see these broken faces–and I can spot them a long way off– I react by trying to take a telling photo. Before photography, I would carefully observe, and I always felt that something was off, that there was something missing that I should be doing. The camera that I now carry with me at all times was, in those days, a phantom limb that ached and burned, its absence felt but not understood…..now, as a photographer, I like to observe and record simultaneously, having finally discovered this missing piece of myself. These girls, in this case Romani (gypsy) are professional beggars. Some have been taken from their places of origin, and are used on the street and managed by what can only be described as handlers, mostly in my observation men, who watch over them, and sometimes collect money in tourist locations ostensibly in their behalf, but that is the ruse. The children are used as props to attract attention, and are sometimes the victims of kidnapping. These kids don’t see much of anything around them, and they wander…. a peculiar sort of wandering that combines random meandering toward various people to ask for money, and a strange urgency. I now realize that they must collect money, and that in many cases, the child does not directly benefit from collected funds. It’s handed over to an adult. The children can be seen at all hours, sometimes in groups and sometimes alone. 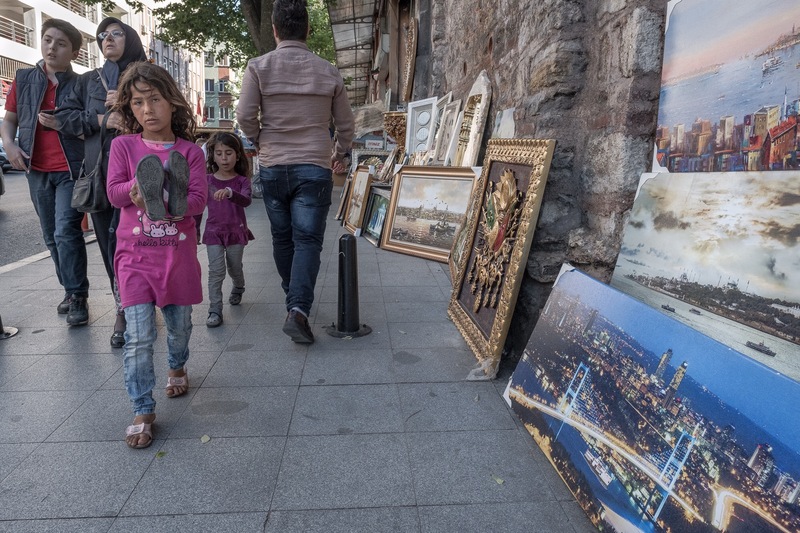 And when I say alone, I mean alone…..at night, mostly single boys as young as five years old, wandering the busy and unstable streets of downtown Istanbul.